For those who have the psychic capability to see spirits, this guardian will appear as the goddess, Amaterasu. 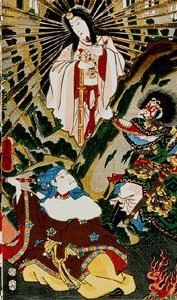 In addition to the standard Guardian capabilities, it has a strong tie to and the associations of the goddess Amaterasu. It has a tie to and can channel solar and water elemental energies, and may be able to alter probabilities. It may be able to aid in the growth of plants.